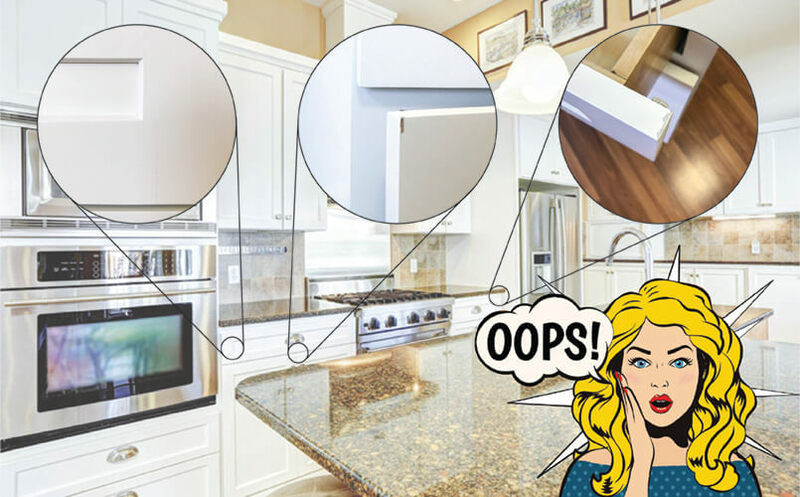 Home > Kitchen Cabinets Reviews > Southport White Shaker (The RTA Store): Significant damage, had to order replacement! Southport White Shaker (The RTA Store): Significant damage, had to order replacement! 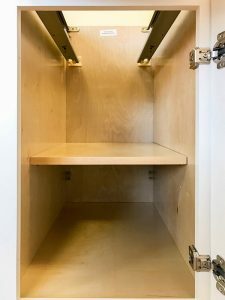 Today I assemble the Southport White Shaker Cabinet from theRTAstore.com. This cabinet took just over a week to arrive from the time I placed the order from theRTAstore.com, which is within the shipping time guaranteed on their website. 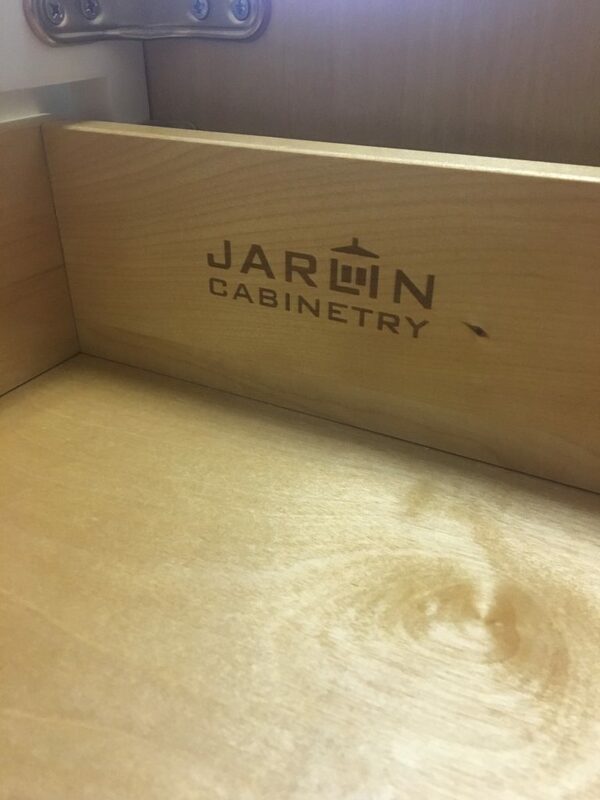 Seeing as how this is a Jarlin cabinet, I am very interested to see how it stacks up next to the Forevermark cabinet that was sent to us as the Aspen White Shaker. 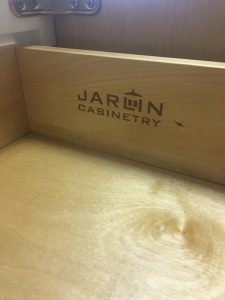 Both of these companies have positive reputations in the manufacturing of their cabinets. The Southport White Shaker cabinet has a very impressive face. The door and drawer front have sharp professional angles and the door is a traditional 5 piece frame and panel design. The door is made with maple wood frame pieces surrounding an MDF center panel. This composite wood center panel is usually used as an effort to prevent cracking from the wood warping and expanding. The frame of the cabinet itself is also a hardwood. Their website does not list the species of wood for the frame but I assume it is also maple. The finish on the Southport White is also impressive. At first inspection, I could see and feel the thick smooth quality of the white paint. The paint is thick enough that you have no issues with wood grains showing through. The interior of the Southport White is a natural wood. This Non-matching interior has a wonderful looking wood veneer. The wood veneer and natural grain pattern help hide any unsightly shelf peg holes. The face frame of the cabinet only overlaps about an inch, pretty standard. The body of the cabinet is made with 1/2 inch thick plywood. The panels are held together with tongue and groove as well as some metal brackets. The back panel is the standard skin panel with “picture frame” support. Southport White Shaker uses metal corner braces that worked well. 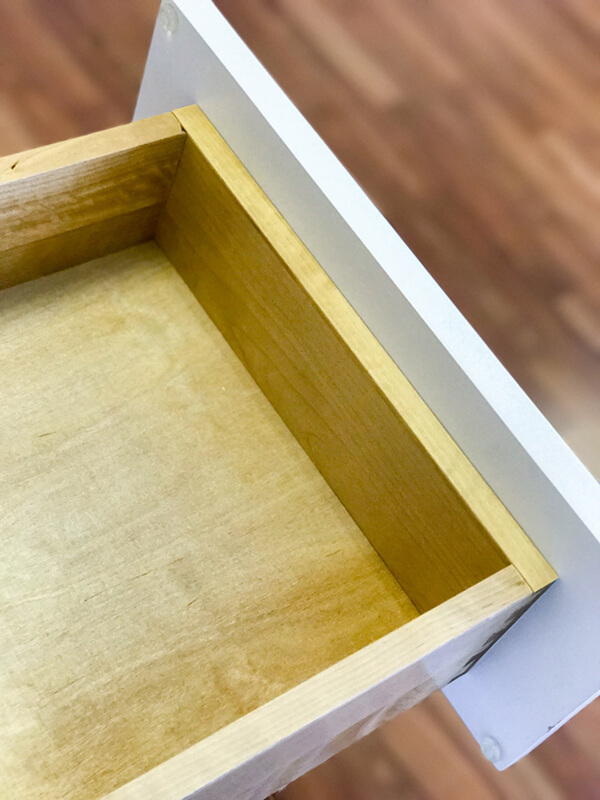 The drawer box is one of the best parts on the Southport White Shaker. The side panels of the drawer box are all solid hardwood and they are 1/2 an inch thick. The bottom panel is a full 3/8 inch thick. The dovetails are excellent; they feel strong and are easy to fit into place. Along with the drawer box, the internal storage of this cabinet is really where the Southport shines. The frame on the cabinet has a fairly standard overhang. 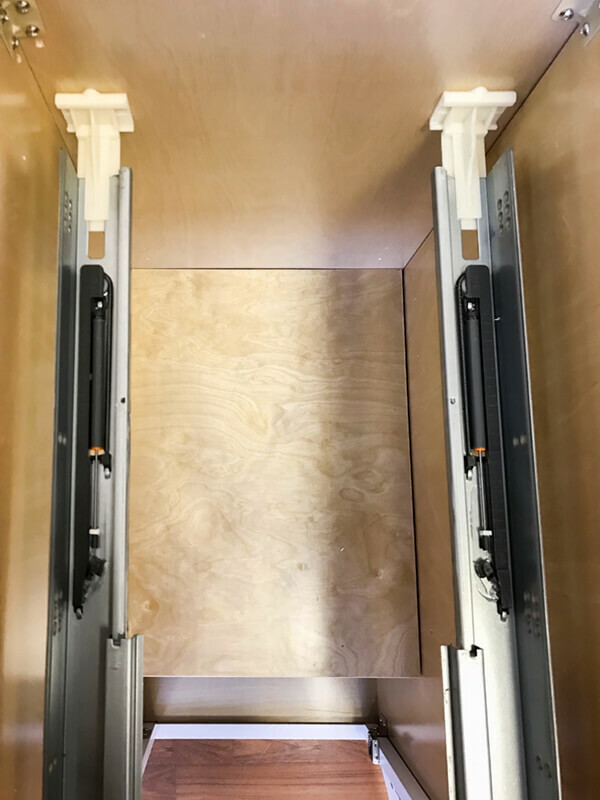 The drawer is a full extension drawer with soft close undermount tracks. The depth of the drawer is about 3 3/16 of an inch deep. The shelf is just shy of being a full-length shelf, about 20 inches. It is a great 3/4 inch thick shelf that is finished on all 6 sides with the same great wood veneer as the interior! The shelf is held up with 4 discreet metal pins. 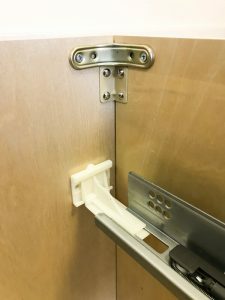 The soft close mechanisms in each hinge all seem to work well. 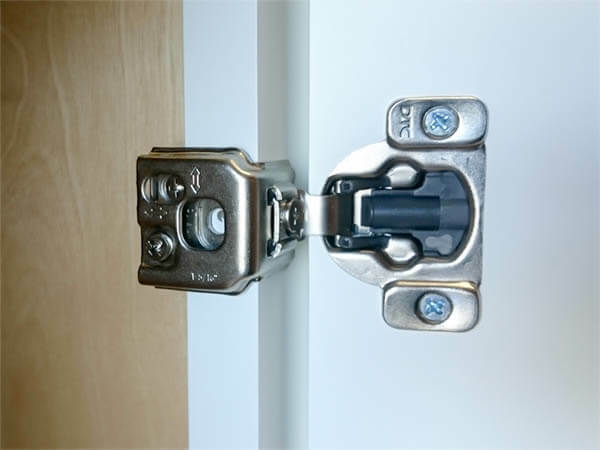 Each hinge attaches to the frame of the cabinet with one screw. They’re easy to attach and they seem secure. The slides on the drawer tracks are of good quality. As I mentioned before, they extend the drawer all the way out. They attach to the back panel of the body with a plastic bracket. Naturally, they have a very good soft close mechanism in them as well. This cabinet is held together with a combination of tongue and groove joints and brackets. The Southport cabinet feels very sturdy; the top is held together with corner braces like the other three RTA store cabinets but these corner braces are made of metal. They seem to stabilize the body of the cabinet itself the as much as the wooden corner brackets provided by the other Shaker models from theRTAstore.com. A lot of care has gone into packaging this cabinet. The outside of the box has a number of edge protectors. The box is of good quality cardboard. Inside the box, there are plenty of Styrofoam sheets and Styrofoam blocks. There are also some smaller edge protectors inside the box. The hardware is packaged inside of smaller boxes. 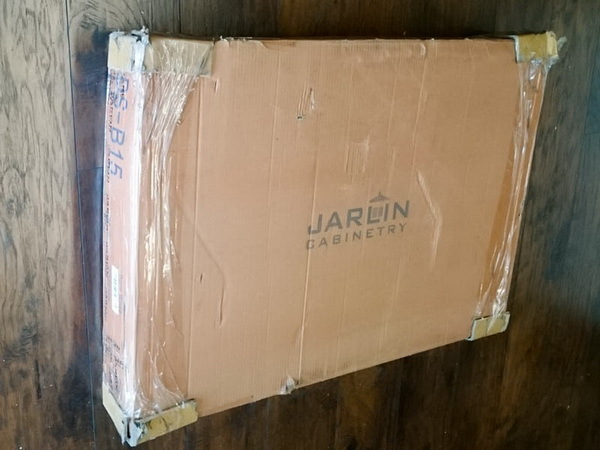 The frame and doors were packaged inside the same box as the body of the cabinet. In fact, the packaging is so thorough that it is truly surprising this cabinet has so much damage. Assembling this cabinet is slightly frustrating. No instructions are provided and the damaged pieces present unseen challenges when I attempt to fit them together. Luckily, the actual process of putting this cabinet together is fairly straightforward and simple. Similar to the Arctic and Brilliant White cabinets, the Southport is assembled using tongue and groove joints as well as metal brackets. It is not difficult to get the body of the cabinet assembled working solo. As far as tools that are used, I am able to complete the assembly with a rubber mallet, a knife to open all the boxes, and an impact driver. *Most of the issues or problems I’ve run into are a result of the cabinet coming with no instructions. The hardware comes with 4 different sized screws, which I had to make my best guess as to where each screw would work best in the process of assembling the pieces of the cabinet together. 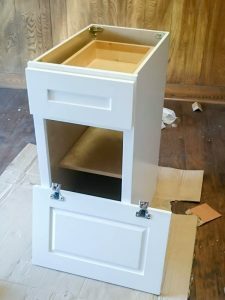 Attaching the door and drawer are both very easy. 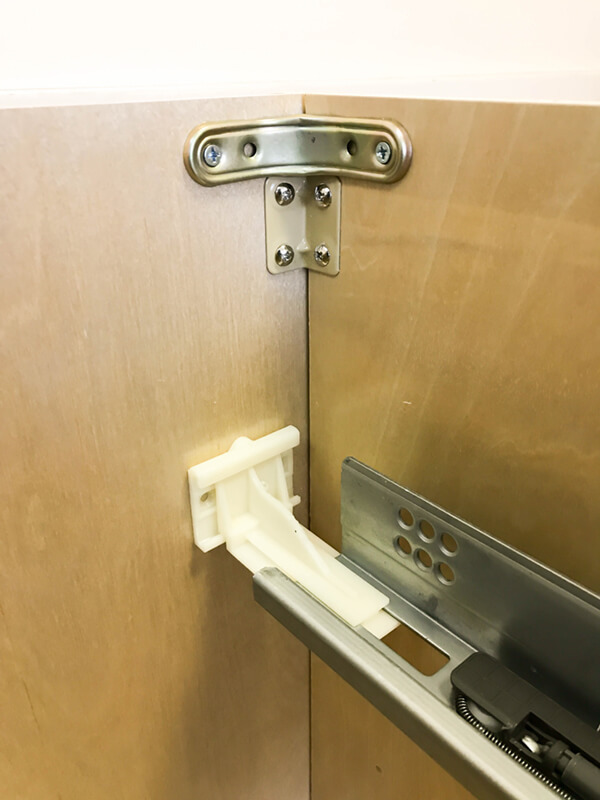 The door hinges came with pre-drilled holes. Those are the only pre-drilled holes on the cabinet. 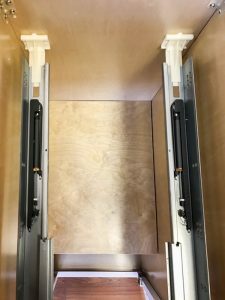 The metal braces are very easy to assemble, although I would suggest boring holes into the panels prior to fixing the brackets into the corners of the cabinet box. Anytime you are assembling a cabinet that is joined with tongue and grooves, it is a great idea to use some wood glue in the joints. If you clamp the cabinet down and let the glue dry you will have a much stronger cabinet. So far my customer support experience has been pretty good with theRTAstore.com. They answer the phone and they seem to know what they are talking about. After asking a few questions on their Live-Chat service I was able to get the info that I needed before ordering. Throughout the ordering process, they have been prompt with their emails. The designers were able to provide me with a clear well-designed kitchen based on a simple sketch that I provided. They listened to my concerns and made changes accordingly. When I did have a problem with a defective door that was sent to me, they responded the next day with all the requirements spelled out as to how I can get a replacement, then explained that I had met those requirements in my email AND that the replacement was on its way. That particular part of their service was something I appreciated. The customer reviews are split. Some of the negative reviews have been addressed and responded to by the company, some have not. MOST of the issues seem to be in the form of shipping delays, damages, and back ordered items. None of the reviews are complaining about their cabinets. The vast majority of their reviews are 4 or 5 stars. Their reviews with less than 4 stars make up a very small percentage of the reviews. The reviews are mostly positive. One review mentioned the type of cabinets available and wanted some more options to choose from. The Southport White Shaker cabinet is a dependable cabinet, taking into account multiple pieces were damaged upon delivery. Assembling this particular cabinet proved challenging given there were no instructions sent and a lack of pilot holes in the panels. That being said, the shelf is excellent and the drawer is high quality. Overall, for the price I paid at $169.08, the Southport White Shaker is a great value. Boxing Match: Which Drawer Box Hits the Hardest? WordPress Theme built by Shufflehound. Copyright © 2019 RTA Cabinet Reviews. All rights reserved.